Hi all, Being an old sailor, the idea of a stay sail intrigues me. Has anyone designed and mounted a mast for a stay sail? Are there considerations that need to be made if I decide to go ahead with this? I can see where a stay sail could be an asset in beam seas to reduce rolling. I've also heard that they can give a bit of a kick while motoring in the right conditions. Also I imagine they could settle the boat at anchor. We have one for our 32' GB. Never noticed it made a difference any time we tried it. Looked pretty spiffy though. It's for those that don't have room for, or want, a davit! Wont help docking in any breeze. As a sailor you are familiar with the noise of a luffing sail when going to windward, that is what powerboats do. Maybe that's why I'd like a mast lol ....or is it homage to the wind gods??? We have a Grand Banks 36 with a steadying sail. 20 years ago we gave up our sailboat, mind willing body says no, but we use our sail. On a beam reach we gain 1/2 knot of speed and it reduces the roll significantly. At anchor with a stiff breeze the boat only moves about 10 degrees off center each way eliminating the dancing effect at anchor. We have tested not employing the engine in 35 knots of wind to see what happens and the result is no forward progress, but the boat stays in a narrow arc head to wind. During that same experiment we allowed the boat to fall off and ran downwind at a speed of one knot helm control was poor. In the previous experiment a boom vang is a must. All in all we are happy that we have the option to use it and would have one on our next boat. We boat in Alaska and have plenty opportunity to use the sail. Anyone using one care to give the dimensions please? How big is it? The sail? I had previously heard that it was not that effective on the Krogen 42, but I do like the idea of 1 knot downwind . I was just talking with Rustybarge today and he gave me an article about a square sail. Also looks interesting. I will talk with a rigger and get some ideas before I leave Europe. I'm thinking of the 5000 nm I will have next year in the trade winds. A staysil being loose footed would make a poor steadying sail. It's too dependant on being filled. A tight sail w a boom would be much more effective unless there was a beam wind. Then I would think the staysil should do fine. Re steading sails and windage ballance, the steadying sail should be aft so the bow isn't blown off downwind. Also at anchor a large enough sail aft will reduce tremendiously sailing back and forth on the anchor rode. Ideally I suppose a sizable sail like the aftermost sail on a yawl would be best ... just above a davit mounted dinghy. And if the sail was big enough and far enough aft one could shut down and drift head into the wind w a calm cockpit. I had an OB boat once that did that w/o any sail at all. That was a plus but the price to pay was bad handling on following seas. Two staysails are more effective than one. A boom vang is a length-adjustable support that runs from lower on the mast to a point out on the boom. The ones I'm familiar with are hydraulically adjustable to support the boom and allow adjustments to the sail's shape. The Nordy MS56 (muh dreamboat) uses a heavy Leisure Furl boom with the main furled in it. The vang is used to take the load off the cable (shroud?) out at the end, and this boom is also used to bring the dinghy up to the boat deck. It needs a little help. I read it is to be set 1.8 degrees below horizontal on those boats. Pretty heavy unit, I guess. We have a steady sail. The main benefit of the sail us to reduce the swing at anchor. Under way there was no benefit. The sail size is the full height of the mast, 15 ft, and width of the boom, 12 ft. Sail are where an option for some tawlers and some trawler where added. The rw 58 did not and was added later. sails where add to a sister rw 58 and changed to a motor sailor, which significant increase the range. When we, my wife, bought the eagle, we were newbies, and did not know under stand what she bought. Going thru all the stuff, we found canvas for the back deck, and SAIL Not knowing we figured we could sail the Eagle. So went out on a windy day in the middle or Lake Union. After several unsuccessful attempt. (although believe I made that photo while Otto drove the boat). Typically, a steadying, or "staysail" on a trawler is smaller than the sail for a small dinghy, say eg a Laser. The effect on a Laser is to make this dinghy, weighing 150 lb all in, go fairly well. To translate that to a trawler weighing upwards of 20 tons, or more than 250 times as much, is to get roughly 1/250 times the speed a Laser is able to get, from the wind. So if a Laser gets to 6 knots in a certain wind, your trawler will get a benefit of 1/250 x 6 = 0.02 knots, less deductions for a less efficient hull shape. To use the sail for steadying, is to align it with the centerline of the boat and when the boat wants to roll, the sail is there to resist. To use the sail for wind cocking while at anchor, the sail must be aft of the pivot point of the boat, or for best results, at the stern, where the sail will offer windage when the boat swings, that will pull the stern back, tightening the anchor rode and keeping the boat pointed closer to straight ahead. While pointing straight ahead, the sail offers no windage, so there will be some falling off and hunting for direction. Unless your trawler has a good location for a sail, hoisting will be a total waste of resources. Boats set up for sails, like Mark's, allow the hoisting of a large enough sail area to offer measurable help if downwind in the trades, mounted out in front, where they pull the boat, but can't be used for steadying or for wind cocking. 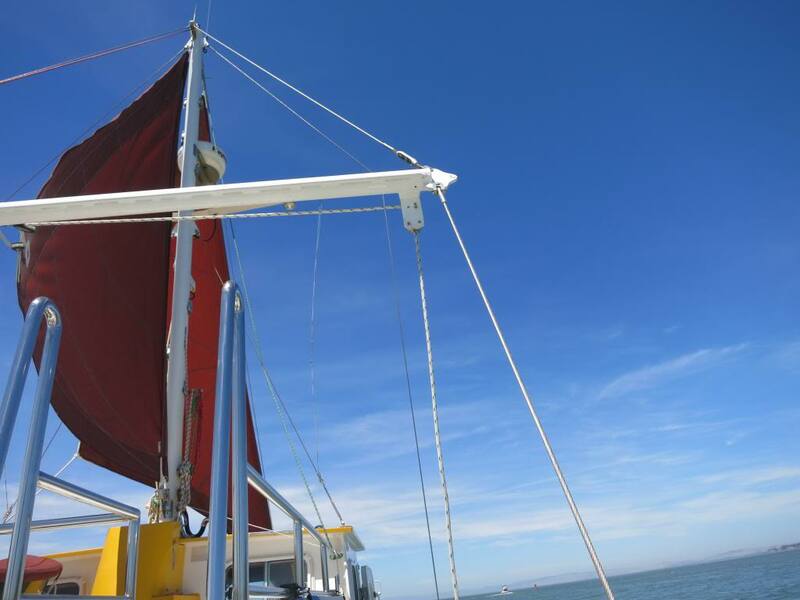 The small sails sometimes seen on GBs and similar boats are generally too small to offer any assistance travelling, too far forward to help holding position in an anchorage, and too small to do an effective job of dampening roll. Which is why I asked those using and seeing positive results...would you please post some dimentions.